Music : The fast rising artiste has signed a landmark deal to take his career to the next level. The multi million naira deal would see the label, ETINS record and management, Longitude Promotions position the promising talent as the artiste to watch with this multi-album deal. Victor AD is a fast rising Afropop sensation hails from Delta state Nigeria but born and had his early life in Lagos. The rising act first showed interest in music at a very tender age of six, influenced by the likes of Bob Marley, Sunny Ade, Michael Jackson and Lucky Dube, then he began composing his songs. Before his professional sojourn as a musician in 2014 with the single titled ‘Jowo’, he led a music band in Delta State Nigeria and he was crowned the ‘best singer’ during his diploma days at federal polytechnic, Auchi. On his signing, Sean Efosa the CEO of Longitude reveals that Victor AD fills a very crucial space in the Nigerian music landscape. His sound, passion and his work ethic is second to none and he is very certain that Victor AD will take the music industry by storm. 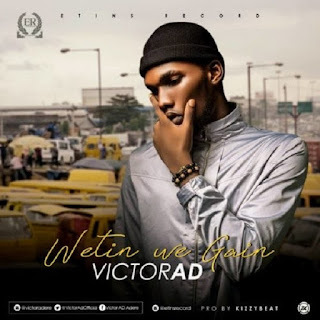 Victor AD on his part has expressed his appreciation and reveals he is back in studio making more music. Victor AD is about to infuse more life into the already bubbling Nigeria music industry as we awaits video of his banging single “ Wetin We Gain ”.